We began our mission to build the future of money by creating a licensed cryptocurrency exchange and custodian that allows our customers to buy, sell, and store cryptocurrency in a safe, secure, and compliant manner. A trusted and regulated platform, however, is just the beginning. 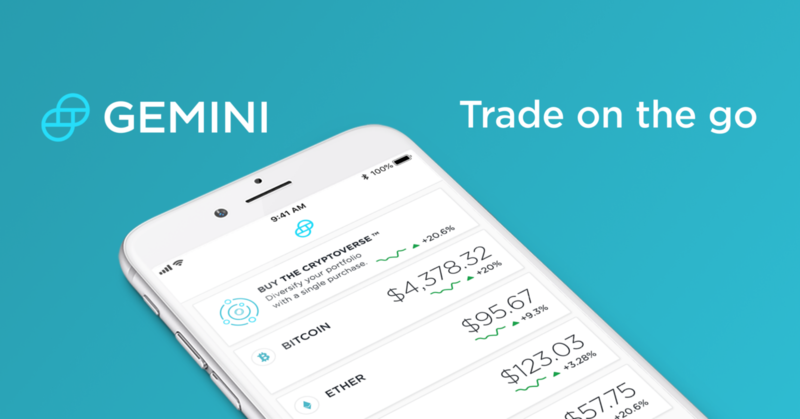 The future of money is both digital and mobile, and now Gemini is too with the launch of the Gemini Mobile App! Download the Gemini Mobile App from the Apple App Store here or from the Google Play Store here. Now you can trade cryptocurrency on the go! Once you sign up, you’ll be able to deposit funds into your Gemini account and buy or sell cryptocurrency with just one swipe. As soon as you download the Gemini Mobile App, you can check prices for a given cryptocurrency and access historical price data for bitcoin, ether, litecoin, bitcoin cash, and Zcash (whether or not you’re a registered customer). As you build your crypto portfolio, you’ll be able to see how price changes affect the value of your portfolio. Want to act fast on price movements? Now you can set price alerts that will send you a push notification when a price moves above or below a certain price point — or moves by more than a certain percentage value. Turn on the ‘Recurring Buys’ feature to repeat an order at any frequency, time, and amount of your choosing. You can buy The Cryptoverse™, a basket of the cryptocurrencies available on Gemini (weighted by market capitalization) — with a single order! Now you can send and receive crypto on the go! We spent the last three years building the world’s most trusted cryptocurrency platform and today we are excited to extend it into your hands and allow you to engage with cryptocurrency wherever you are and whenever you want. The Gemini Mobile App is one more step towards building the future of money. Download the Gemini Mobile App from the Apple App Store here or from the Google Play Store here and join our mission!